Easy to operate and clean after use. 1.5’’ small chute feeder not suitable for large fruits, hence you may need to slice before feeding through. 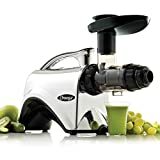 This is one of the best omega juicers in the Omega series; proof has it, in that it has been on the market for a while now, with a huge number sold. 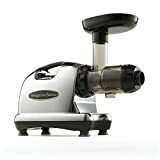 The Omega J8004 Commercial Masticating Juicer features a single gear commercial motor and coupled with its dual-stage juicing it will leave you with an almost dried pulp. Its auto pulp ejection system makes juicing continuous and enjoyable, and the powerful motor runs on 80RPM slow speed, thus providing a healthy juice with its nutrients and enzymes retained. The 8X stronger GE Ultem Auger makes the juicer able to process a wide variety of ingredients, such as vegetables, hard fruits, leafy greens like spinach, wheatgrass, and even kale. It measure 14.5 x 6.5 x 15.5 inches and weighs 17.5 pounds. 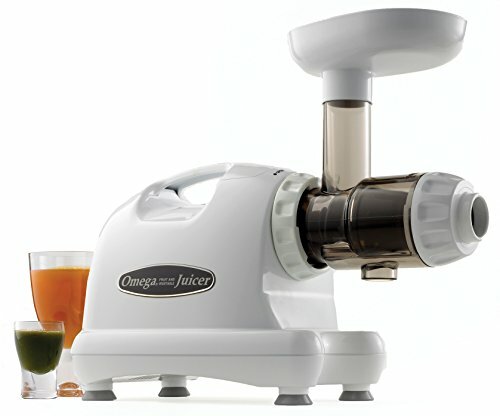 Just like any other omega juicer, it has a warranty of 15 years.